A slow start. I find breakfast in a local bar. The guide book says it's going to be an easy day but that's a lie. It's mainly on nice quiet winding roads but the hairpins are shortened by sudden plunges into eucalyptus plantations down ravines with streams at the bottom, that need to be forded on wobbly stepping stones, followed by steep ascents. Knackering. After 3-4 of these I decide to walk the extra distance on the Tarmac. Fording stream 1 was the easiest. I liked the yellow arrow just incase you were unsure. Locals are invariably kind and helpful and bear with my appalling and 'not getting any better' Spanish. They often stop for a chat or stop their cars to point out the route. It must be strange to have a constant flow of strangers striding through their towns and villages. Most of the walk is along the coast amongst woodland, with sudden views of a deep blue sea and an occasional secluded cove; mysterious deserted places. I come across another ox-shoeing frame in a small village. A remnant from another world. I arrive at the albergue in Cadavedo about 3.30pm. A nice Frenchman makes me a cup of tea. It's extremely basic, but clean and after washing me and some clothes, I go and find the local restuarant. A family run place, full of more families finishing their Sunday lunch. I'm late but they still serve me Menu del Dia. Chick-pea and prawn stew followed by a huge plate of cooked ham in onion gravy and chips, of which I manage about half. Followed by coffee. After I go the the bar down the road and order a glass of red wine and write my blog. Then back to the albergue - full house; mainly French and Germans and a sweet Czech girl. No one mentions the Referendum. The on-line reading is sad. It's dawned on the Cornish and Welsh they will loose their millions of pounds of EU funding. What were they thinking was going to happen to it? I'm now just over halfway through my journey. Joseph Campbell in his studies of the 'Hero' mono-myth writes that the hero has to leave everyday life in order to set out on an adventure and that halfway is the most perilous time. It requires a period in the underworld, an impossible task or a dangerous encounter. Before dipping down into this Other world, which may require death of the old order, s/he is often given wise guardians with good advice which they require to survive (often by old crones). If successful they may return Home with the wisdom they have gathered. I feel now that I'm needing to confront some of this darkness in what's happening at home. Some deep underground structures that underpin my identity have been shifted. I need to go and have a look at the damage and find out what else I am in this dark, wordless base-chakkra place. 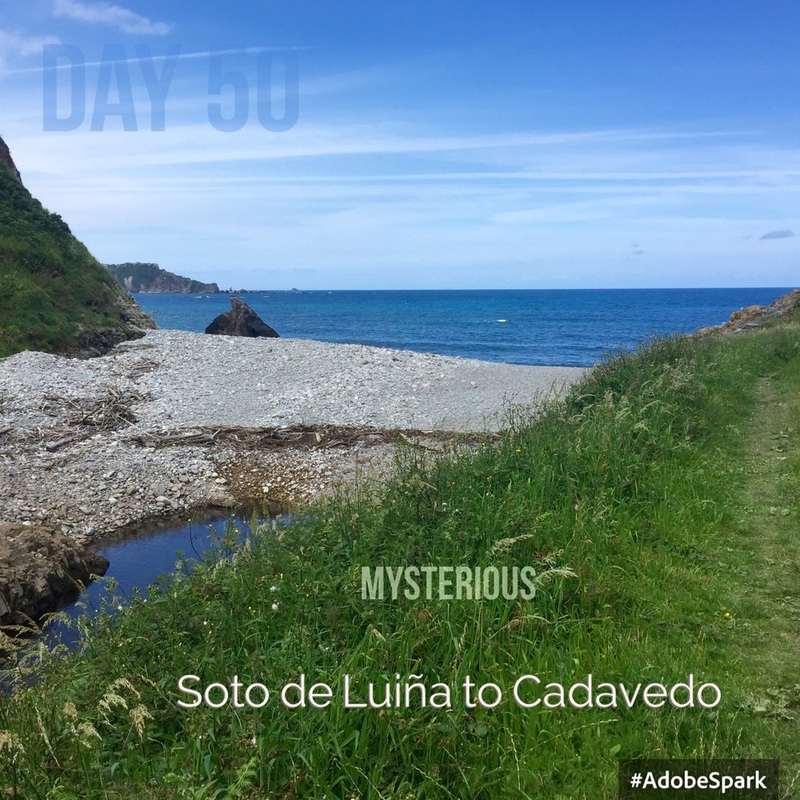 What will the Camino give me to bring home with me? Pacer tells me I've done 33,777 steps with an active time of 5.5hours- which it thinks is 16 miles but is probably 14. Feels it!